The first thing that helped was putting the Cat 3750 stack in the same rack as the patch panels that they were patching into. No more up-and-over for client connectivity. This eliminated the majority of the mess that you see hanging over the ladder in the first pictures. The second most important thing was the Panduit rack that we got for the Nexus. I have never ever seen a more spacious rack in my life. This thing is absolutely worth every dollar. There are at least 8 inches on either side, plus built-in vertical cable management the entire height of the rack. There are 3 punch-outs on the top of the rack on each side, making cables that have to go out the top easy to route. Probably the coolest thing about it is that the door can open on either side. Definitely a plus when doing the initial migration. 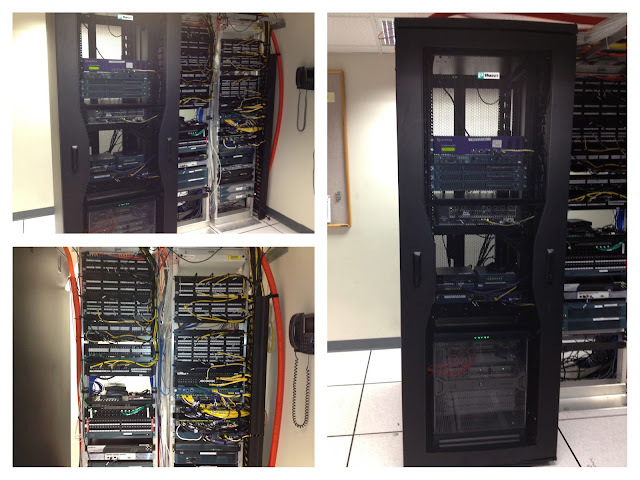 We ended up putting some ASAs, a WLC, a VXR7200, a Packeteer, an ACS appliance, and three Cisco NAC appliances in the same rack and there's absolutely plenty of room to add more and still have premium cable management. 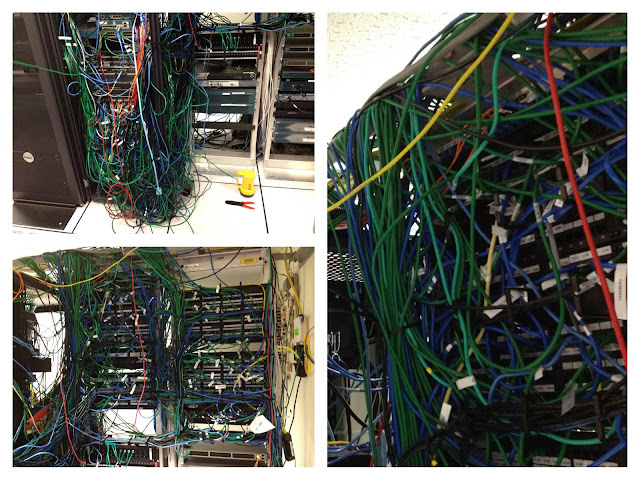 Remember, when you have a cabling problem, don't be scared! If you tackle it one cable at a time, eventually it'll look like what I ended up with! Cool, though I have no idea what most of the terminology in the other posts mean, this made sense! We too went on a cable-fixing spree in our house last week and now everything looks perfect, is labelled properly and can be easily used. Circle me back on Google+ at https://plus.google.com/115093555862694271963/about/ . I'd love to hear more. I noticed your 5 digit rep on SU, SF and SO. That's so cool! And while it might not get me a job (http://programmers.stackexchange.com/questions/20407/will-high-reputation-in-stack-overflow-help-to-get-a-good-job? ), it will be something to brag about. And since I'm 13, I have _waay_ too much time on my hands. Any tips on how to get there? Vertical rack cable Management begin with the patch panels which are upgraded and can be easily mounted at the rear of the cabinet.